Offbeat Press is a screen printing and creative design company that combines small business, fashion, and social activism. Owner Drew Mueske leads the oldest environmentally friendly screen printing business in the Midwest, as well as Hype Visual, its creative design office. A designer by training, Mueske’s interest in screen printing began in college. 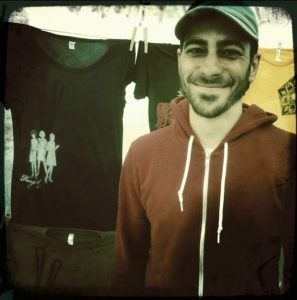 Starting small, he created and sold original T-shirts at events like the Brady Street Festival, the Willy Street Festival, and Pridefest. After a few years working for advertising agencies and freelancing post-graduation, Mueske noticed an alarming deficit in the Midwest printing industry. While eco-friendly options are available, printing companies conform to the industry standard of petroleum-based inks. Not only does this method depend on oil, but it produces toxic chemical byproducts that harm ecosystems, wildlife, and humans. A leader in its industry, Offbeat Press utilizes eco-friendly water-based inks. Water-based inks are an environmentally responsible printing medium that result in softer, breathable prints. It’s a skilled craft, so supporting local, skilled artists is an additional benefit. Although Offbeat Press opened at the height of the 2008 recession, its eco-friendly values have only bolstered its growth over the past 8+ years. Intentionally supportive of other small businesses, Mueske has built reciprocal relationships with retail stores, yoga studios, and progressive businesses across the country. The printing shop also offers discounts for nonprofit organizations. An ally to the LGBTQ community, Mueske has printed for Planned Parenthood as well as university LGBTQ offices, and has maintained a presence at events like the UW-Oshkosh ally march and Madison’s Fruit Fest. As an ally, Mueske enjoys being a part of the LGBT Chamber of Commerce because fostering inclusivity and diversity are part of his business ideology. Noting that the conventional Chamber of Commerce model doesn’t tend to be small business friendly, connecting with the LGBT Chamber of Commerce is a natural extension of the values that drive Offbeat Press. In addition to the LGBT Chamber of Commerce, Offbeat Press is a member of the Midwest Renewable Energy Association, Green America, and the Wisconsin Network for Peace and Justice. Check out the Offbeat Press, Hype Visual, and Progress Label websites.